So you’re here, settled in, managing the transport system and have started to master the art of becoming a local. After relocating you’ll want to spend some time exploring the city as a visitor and as a tourist. This is one of the world’s greatest tourist attractions in itself, so before you become a jaded native, you need to spend some time just touring the ‘hot spots’ in this fascinating city. This series on Sights will highlight some of the most popular tourist attractions that the city has to offer, and what most folks will not admit to is the fact that even the locals like to visit them over and over. The sights are not confined to Buckingham Palace and the Tower; there are many exciting attractions in this bustling city that will add to your entire experience. This is a must-see-absolutely-have-to-visit attraction. 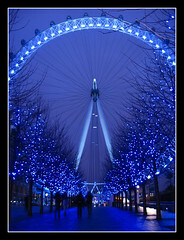 Also known as the Millennium Wheel, it was constructed to form part of the London celebrations for the Millennium. The London Eye is actually a massive Ferris wheel, the largest in Europe that has become one of the iconic landmarks here. There is not a postcard of London that does not show the ‘Eye’ from every angle and place in the city. Offering unsurpassed views of the entire city, The Eye has been constructed with an original and unique cantilevered construction that rotates, carrying the large viewing pods in a slow circle. You’ll have to take a camera to make sure that you get some photos of the spectacular birds-eye views of this city. If it is your first time here, then visiting the London Eye is a great way to see how the city is laid out around the River Thames. The parks laid out beneath you, the Tate Modern to the south and even as far away as Kew, which is the site of Hampton court Palace. This is unique viewpoint, and it will give you a much better idea of the different areas in the city.